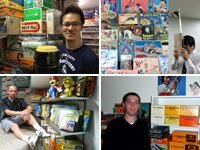 It's my objective to collect and document - on this blog - every game and toy produced by Nintendo from the early 1960s, when they started as toy maker, up to the phenomenal success of the Family Computer in the mid 1980s. My collection initially grew rapidly, amassing many of the items that are still quite easy to find, even though they are from thirty up to fifty years old. But after these early collecting sprints, I slowly drifted into more challenging territory. As a collection grows, it is almost inevitable that the gaps become increasingly difficult to fill. In the case of vintage Nintendo items, it is not so much the cost of items that makes completing a collection difficult. Finances do play a role, as a number of these things are rather expensive; like the Computer TV Game and some of the Ultra Man themed games, for instance. But although prices seem to be picking up in recent years, due to the number of collectors increasing, those pricey items still tend to be the exceptions. For the largest part, it is the scarcity of the items that is the problem challenge. Most, if not all, that is left on my wanted list is simply extremely difficult to find. Added to that the desire to find items in good condition and in original packaging, and patience and perseverance are needed more than anything else. I recently found three items that I had been looking for for a long time: Nintendo's Mini Game Horse Race, N&B Block Parts set P-35 and the blue boxed Ultra Hand. The Nintendo Mini Game series consists of at least 50 different games. I was still missing two of these, but was lucky to find one of them the other day: Horse Race Game (競馬ゲーム). Which means I am now down to one to complete this series (also see the 'wanted' section below). These simple, yet colorful and fun games are amongst my favorites from all the toy series that Nintendo made in the 1970s, so I was very happy to track this one down. It's not only because the games themselves are well designed; the illustrations on the blister pack also have that lovely style that is so typical for this era. This particular game simulates a four track horse race. When you turn the red handle at the front of the track, the course starts shaking, which makes the horses 'vibrate' forward towards the finish line. Even if you mange to find one of these mini games from old unsold stock (as this one is), the packing is often quite stained and damaged. This one still looks pretty good, especially considering it was made forty years ago. The Nintendo N&B Block series can be extended with a range of parts sets. Here I was also looking for only two items to complete this part of the collection, of which I did find one: Parts set P-35. It is a very simple accessory set, but these are often the hardest to find. The 1966 Ultra Hand was a big success for Nintendo. It sold in the millions. As a result, even today it is not that difficult to find. 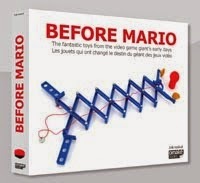 Which is great, as it is a landmark in the history of Nintendo, that belongs in every vintage Nintendo collection. The Ultra Hand remained a steady seller for a number of years, and the box art was redesigned a few times during this period. When you start tracking down all the box variants (and which collector doesn't? ), you soon notice that some of these are much rarer than others. This blue one appeared almost at the end of the Ultra Hand's life cycle, when sales numbers already started to drop. As a direct result of these smaller sales numbers, it is now one of the hardest box variants to find. The box does not have any of the regular Nintendo logos, but only a simple message "Manufactured by Nintendo Co. Ltd." (製造元 任天堂株式会社). This blue version has a nice Ultra Hand logo in katakana (ウルトラ ハンド) on the side, as does the similar white box version. The ST logo on the side of the box dates it at at least 1971. This mark indicates that this toy adheres to the Japanese Toy Safety Standard, a standard established in late 1971. This version differs from the other Ultra Hand versions in the box only: inside we find a regular Ultra Hand and three practice balls and stands. By adding these three items to my collection, I have come a step closer to completing it. But I am not quite there yet. There is still plenty to search for... (luckily). Here are some of the items that I am looking for. If you have any of these items and are willing to part with it (trade or sale), then please contact me.